Now that my father is no longer walking the earth this holiday season, my family is reduced to its essence: my siblings, Dovima and Axel, brother-in-law Herb (with a silent h), and my college student niece, Sweet Pea. There are also the animals: Dovima’s dog, Thurber, Fred, her geriatric fish (he’s 9; a year older than Thurber), and Axel’s two cats: Blackie, the feral guard-cat at work, and Bandit, the pampered, at home. Seven of the eight rate holiday gifts from me. Sorry, Fred, don’t look so glum, but you’re screwed. Me: If I can’t get it online, you’re not going to get it from me. I like fast. I like simple. If I must go to a store, as I did for my sister and Herb’s presents, I go at off hours when I know the crowds will be just the way I like them: anemic. After I exited The Grind on Friday, I blew into a store, found exactly what I wanted to get my sister and brother-in-law, paid, and was back out on the street in six minutes flat Toyota jumping for joy. Almost immediately, I suffered a flash of five alarm fire, heart attack-inducing panic. That was because I brilliantly left their gifts in a convenience store aisle when I absently put the bag down to pick up an eight pack of pocket tissues. Then, I walked away. I made it back to get their presents before the four second window of retrieval granted to preoccupied stumblebums had slammed shut. On Saturday, I shipped my gifts to my sister’s house on the West Coast. I’ll wrap them during my upcoming visit. The gifts that I’ve ordered online are being shipped directly to her; how I’ve been sending my gifts for years. Now that Trader Joe’s Brandy Bean season is over, and with necessity being the mother of invention, I rewarded my gift giving accomplishment with a bottle of port and a chocolate bar. 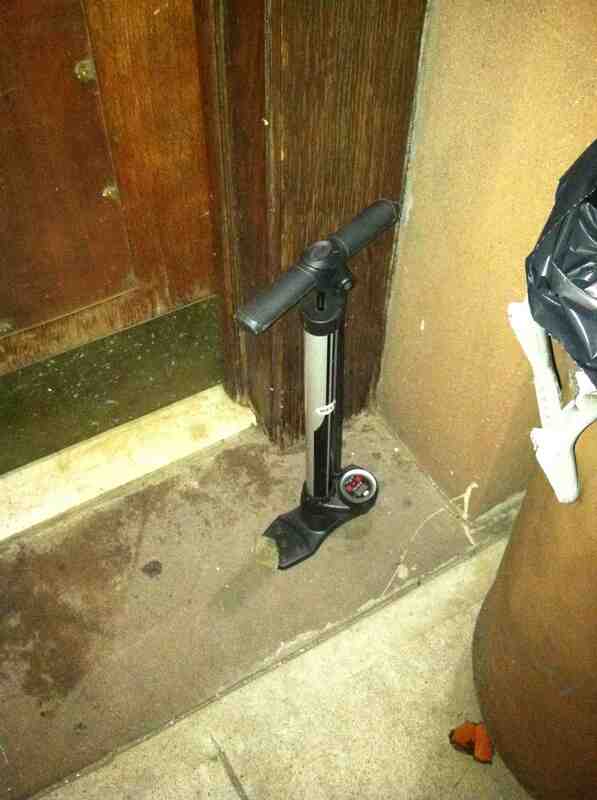 As I was entering my building with my treats, I noticed a tire pump outside the door. Home is where the tire pump is. Me (thinking): My building: the gift that never stops giving. 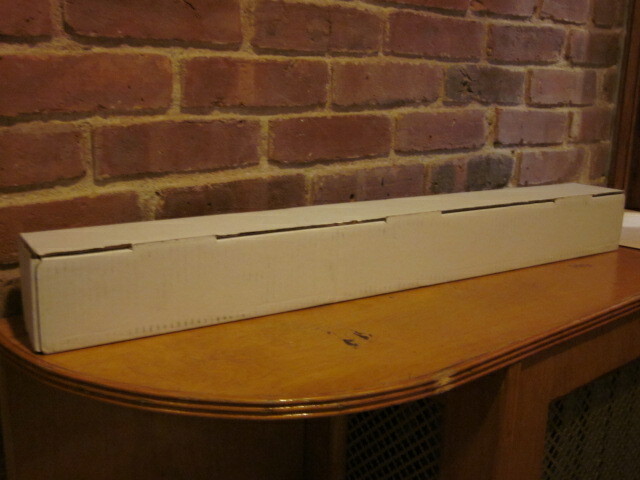 Once again some nameless tenant, possibly the one who places the cardboard pizza boxes in the recycling can meant for plastic and glass, left this hand me down up for grabs. Does this person also wear their shoes on the wrong feet? If I were inclined to be Tightwad Incarnate to those near and dear, based on what tenants have left on my building’s radiator cover through the years, there are many offerings I could have given. I occasionally photograph them. Pictured below is a selection. Often, there are books and magazines. Sometimes, appliances, including computer hardware. Once, a glove I lost was left there and once, I placed a glove I found on there. Hey, pay the good deed forward. With great regret, I did not photograph the samurai sword someone left in the trash a few years back, but that artifact from feudal Japan, or more likely, China via a Canal Street junk store, was not gracing the radiator cover. 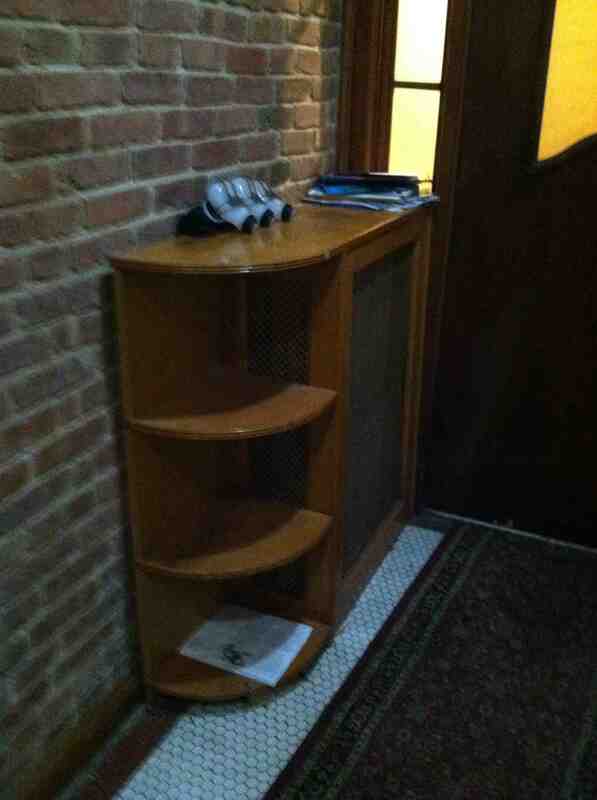 This is the radiator cover as it is seldom seen: naked. Here it is with a trinity of plastic What The Hells possibly produced by Acme. Acme What The Hells. But anyone’s for the taking. 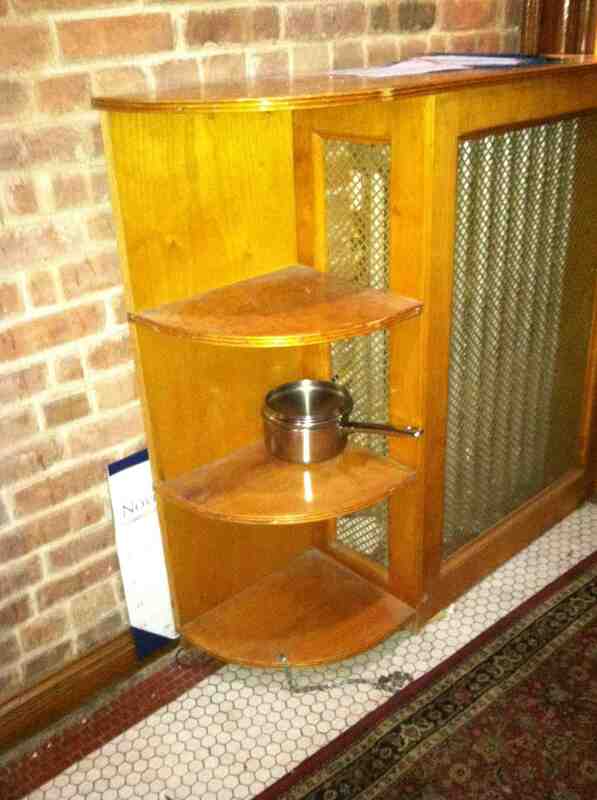 Currently, there’s a soup pot up for adoption. And a calendar with both November and maybe December! 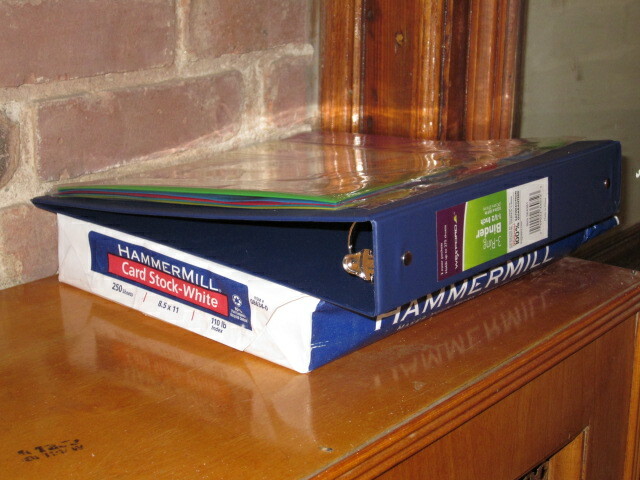 In September 2012 there was an empty binder and card stock. 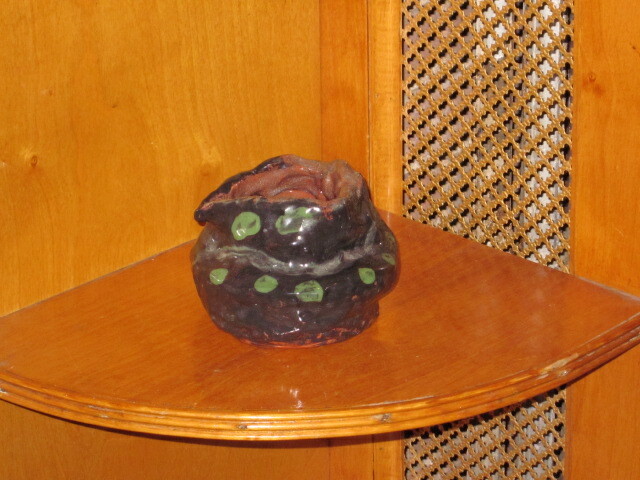 A month later, there was this glazed ceramic blob. One summer there was The Mystery Box. It sat around for about a week screaming volumes about the lack of curiosity amongst the tenants. 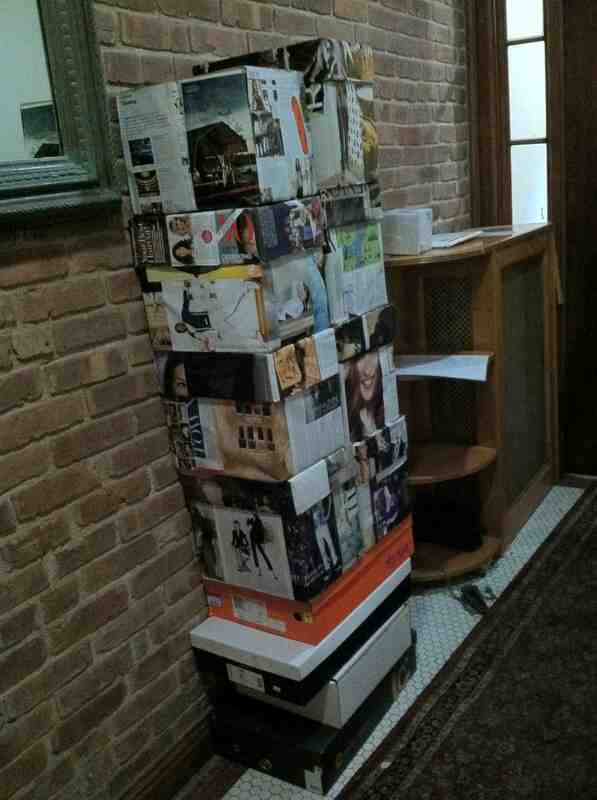 Magazine paper wrapped boxes that sat in the vestibule last spring. A few were taken by some schmuck or schmuck-ette addicted to clutter. 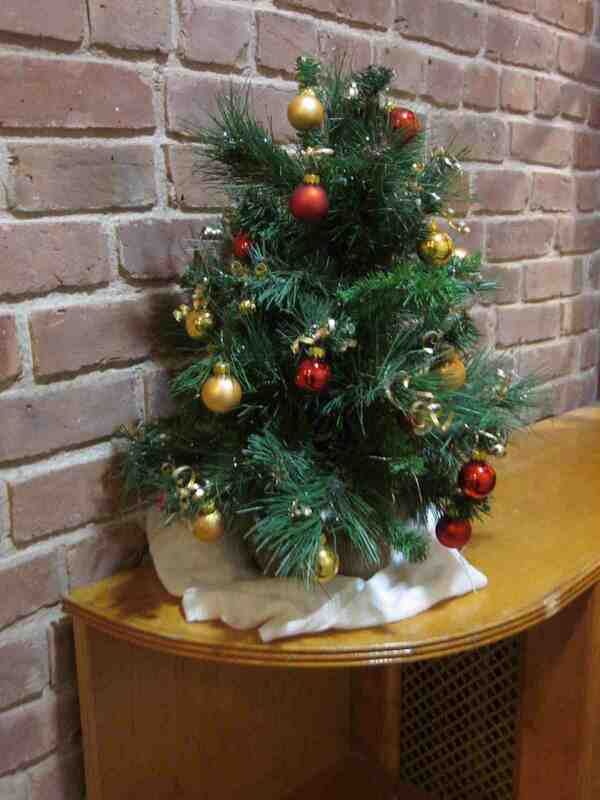 The annual Christmas tree that makes my friend Milton’s heart melt as if it’s a puppy. But I think taking it is theft. This entry was posted in christmas, holiday, Humor, new york city and tagged family, giveaways, holiday season, junk, new york city apartment dwelling. Bookmark the permalink. Fonseca Port and dark chocolate? I’m on my way … and will even be willing to pass (well, a little) on the dark chocolate! … and that that gift-for-the-taking list is something that can serve as an anticipatory event every day! That is very true, Frank. Hardly a day goes by that something is not left on that radiator cover. I’m waiting for the day when someone moving out leaves their cat or parrot. You never know … maybe today is the day! I’m sure that day will arrive sooner than that blockhead figuring out that the green recycling can, next to the blue one, is for pizza boxes. For whatever reason, I doubt it. 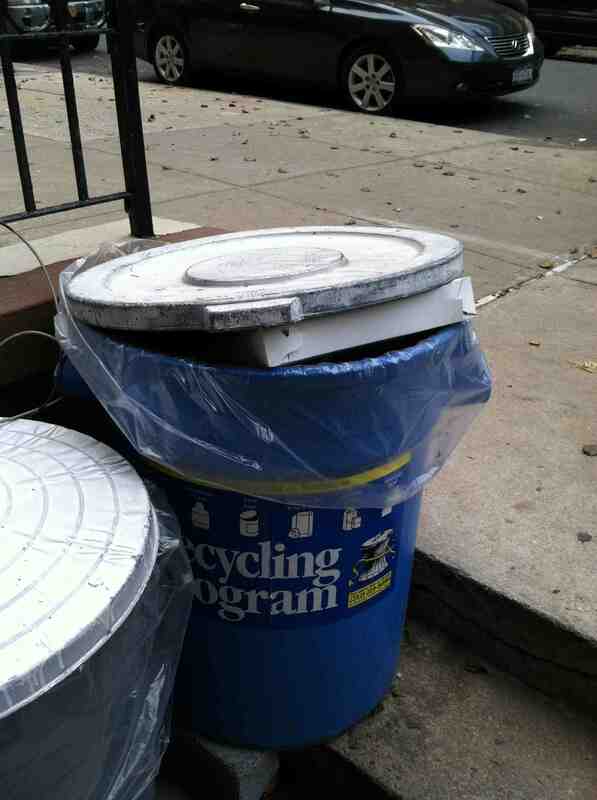 If I did not lead such a full life, Frank, I’d write my next worst seller: Recycling Cans For Dummies. Worst seller? Hmmmm … it may be a worth venture. It does appear gh0stpupp3t that I live amongst at least one reading and comprehension failure. Every place should have a recycling center. Your center is much more attractive than many. 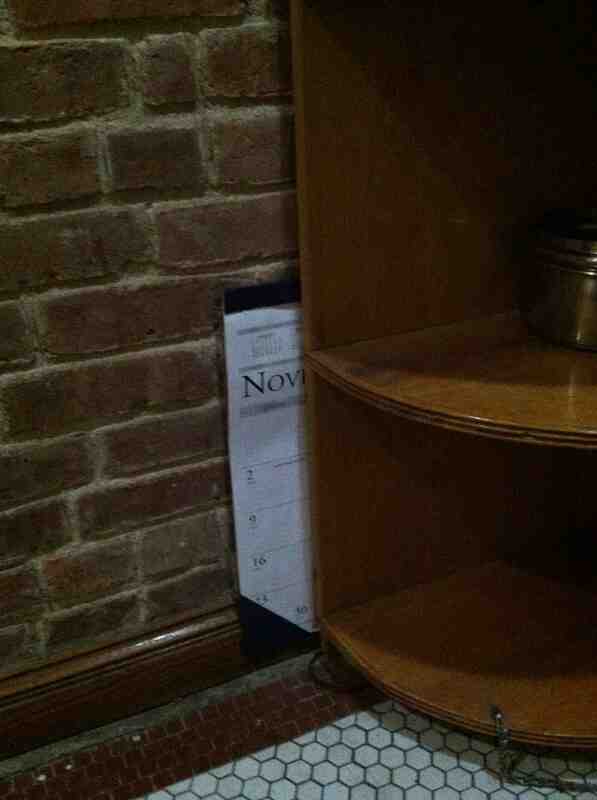 It makes me wonder about people and why they placed those particular things up for adoption. The magazine wrapped boxes were a very generous offering. Fred is 9? Is that a record? Not anywhere close according to this. Fred doesn’t appear to have much gold anymore. Grayed with age? That is true, Jim, Fred is looking much more like a grayfish now … Kinda like most of his human family (underneath all of our hair dye). Thanks for the goldfish facts! I am sure Dovima would love it if Fred made it to 25. He is a comforting presence in her kitchen. When I visit I play a hand-game with him. I open and close my hand outside his tank and he parks in front of me opening and closing his mouth. We could do this for hours. But, we don’t. Playing with Fred is more intellectually stimulating than watching the Kardashians. 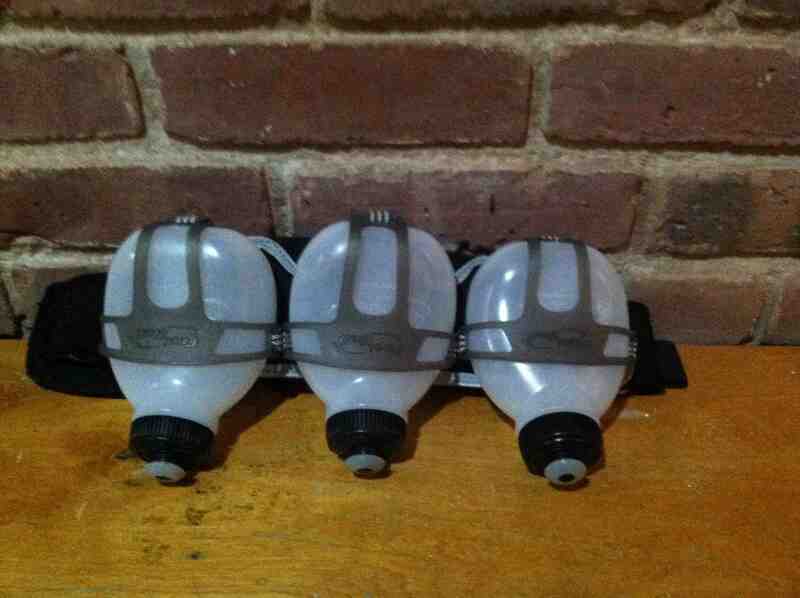 I think those “what-the-hells” are water bottles on a belt and typically used by runners on long runs, V. Although, for sanitary reasons, I wouldn’t be interested in adopting them. And dark chocolate and port sounds like a most excellent reward for getting your Christmas shopping done. The “what-the-hells” are long gone, Cathy. “Sanitary, shmaitary,” said the taker who is currently residing in an Ebola ward. 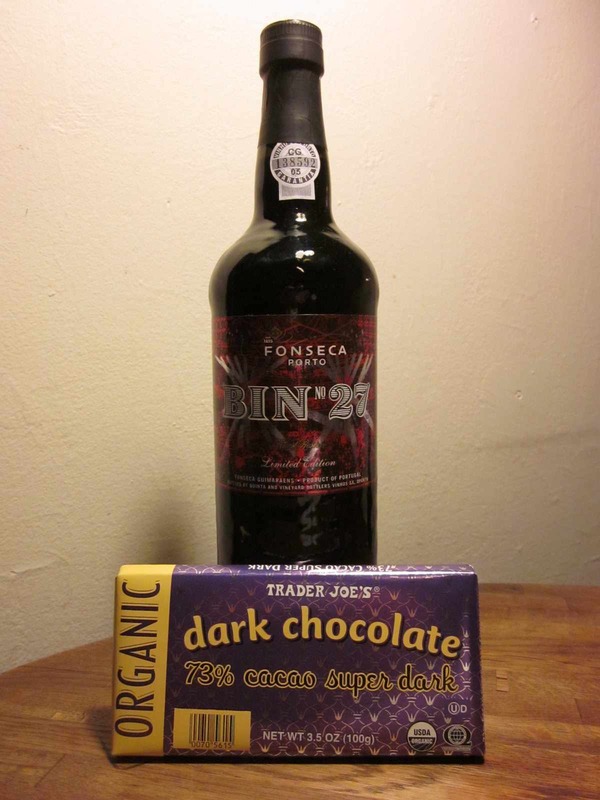 Yes, dark chocolate and port gets me through these cold weather months. Nobody peeks in the boxes to see if there’s anything good in there? I’m with you on the internet shopping – you can find anything you want without ever leaving your chair. And you can be clad in socks and not much else as you do that Internet shopping from the comfy confines of your chair, Lois. I put the Internet right up there with all the other great discoveries: fire, the wheel and the Post-it note. I grew up watching Alan Funt. I don’t peek in boxes. I’m a little jealous. The only radiators we have in Arkansas come attached to an automobile, and so far, no one’s left a gift on mine. Maybe I should be the first. I could donate a half-can of brown shoe polish or a pair of overalls that shrank too much in the laundry. I can’t wait to see the expression on their face when a total stranger comes out to find the hood of his car covered with repurposed treasures. It might be safer for you to wait to see the look on that stranger’s face, Russell. Some folks might not cotton to the gift of your shrunken overalls or half can of shoe polish on their automobile’s radiator. As you’re being arrested, claiming, “Officer, that’s what the city slickers do up north,” might not be a winning defense. I’m just looking out for you, pal. 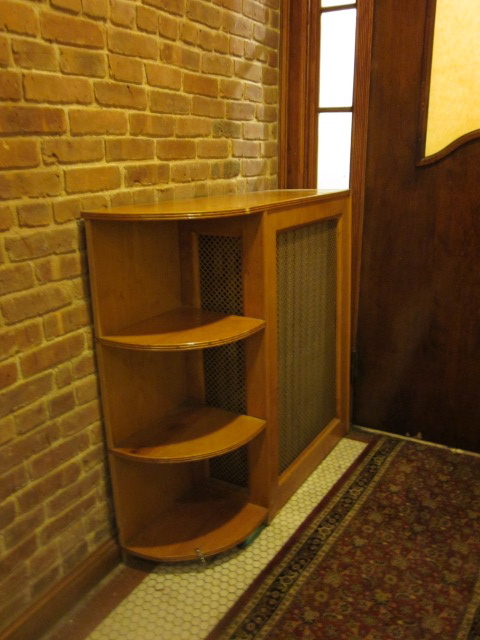 Lots of interesting finds at the radiator cover. I suppose if you’re just patient, eventually you’ll see something you like?! The ceramic glob is kinda cool, no? It’s kind of a community board without the board. Do you ever know who left something or is it always a mystery? No one ever admits what they leave on the radiator cover, Amy, which is about eight steps away from most giveaway’s likely destination: the trash cans outside. I love that there is this unspoken communal spot of ” finders luck” or is it unlucky? Kudos to you for being so organized With your gift giving. If only I were so organized with my card sending! IN 2015, I will try to keep a more attentive eye on the communal spot that seems to score a bigger hit with givers than takers. Some of this crap seems to sit out there for days. You could spread some Christmas cheer by leaving a plate of cookies on the radiator, V. Then whilst you sip your port and savor your chocolate, you could listen for sounds of Christmas delight — “ooh, Ah, Christmas cookies!” some might exclaim, as they take a cookie, surreptitiously looking around to perhaps catch a glimpse of the giver. Who could this kind soul be they would think as they munched on their Christmas treat. And there you’d be inside your home, with a smile on your face, warm from the port and your heart warm from your Christmas deed. It could happen. Merry Christmas, V.
Shirley, you jest, Brigitte. No, no and in case you missed the first two no’s, here’s another: no. What I’d like to give the lunkhead tenant(s) is a wake-up call to dump his/her/their food trash in the proper recycling can. That doesn’t rate cookies. But I might gift myself a shot of port to ease my aggravation. Port it shall be then. Cheers V!!! Ha! My building has the same practice. Anything you no longer want or need goes on the radiator cover. Usually it’s books or magazines, but I’ve seen all manner of strange and wonderful stuff. Empty binders, women’s sweaters, floppy disks (really! ), coffee cups, a bedazzler machine. One man’s trash…is your neighbor’s treasure. I would classify this stuff as more heavy on strange and light on wonderful. Some of it has crossed the line into blight. Just wanted to say again how sorry I am about the loss of your father this year. By coincidence, today would have been my own father’s 99th birthday. Let’s drink a toast to them, with a chocolate chaser. A perfect tribute, I’d say! I agree with you Melissa. A prefect tribute to our dads. Everyone with paws scores gifts. Fred gets plenty of attention and gourmet fish feed. 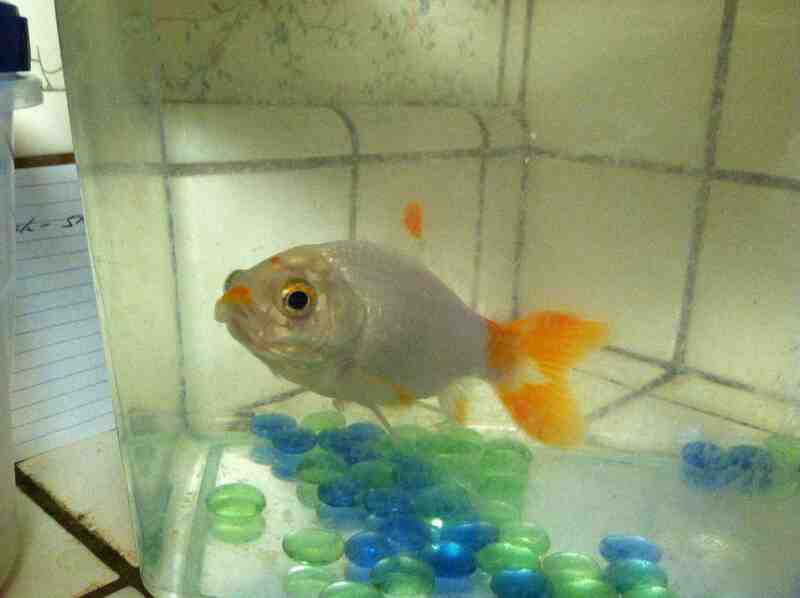 He’s definitely a first world goldfish. The tragedy of lost glove season is well underway on this side of the pond, too. People leave them on ledges and other places where they might be found. I think what you do is very considerate. Of course, the time I lost my gloves, I left them in a taxi and that was in the era before receipts with medallion numbers. As for that massive pink bra hanging on the fence: that smells like a ruse to punk observers, or it was just a memorable conversation piece. It was definitely a conversation piece! Have a wonderful weekend. The same to you and The Better Half! I’m gonna open a store called Port n’ Chocolate. Then, I’m gonna get me a little white dog and call it Port n’ Chocolate. Good thing I didn’t reward myself with Maalox and liver, Jules! “Fetch Port n’ Chocolate” sounds so much more melodic than “Fetch Maalox and Liver”, which sounds even more like a shopping list. I was there! Where I got gifts for my brother and best friend from college. Savannah, I bolted over to your site as soon as I read about your soused cake! I left a comment, but I’m unsure if you got it. I LOVED your post (and ALL the pictures), but Blogger seems to hate me (or, WordPress)!